The strive for a lasting relationship is a driving force and motivation in the lives of many. And by relationships, we mean everything from marriage to dating and ending with the relationship between friends. There are couples in a long lasting relationship that seem to have been made for each other. It is proven that couples who stay together have some things in common like doing chores together, sharing the same values, and have common social circles. Although there are things that are a given when it comes to good relationships, each couple has the potential for making it in the long run. It is our habits that create our character and our lives. 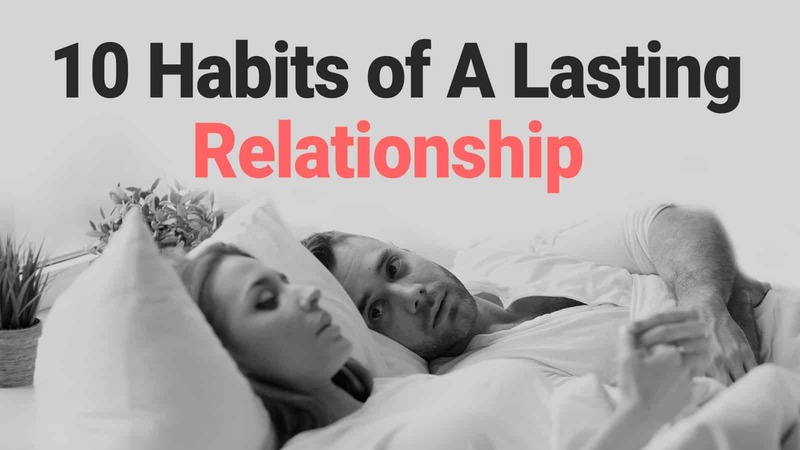 That being said, here are the habits of a long lasting relationship that have proven to work in smoothing out even the roughest rides between two people. Communication is the primary factor behind really good relationships. While all relationships go through hard periods when the two people within the couple can convey what they want to say in a clear and precise manner, it makes things much easier for both people. Many people in relationships somehow expect their partners to know what is on their mind. Unfortunately, most of us cannot read minds or the subtle clues that the other is trying to pass to us. This can cause the other to believe the other doesn’t understand them and lead to anger, resentment, and confusions. In a relationship, the two people will have a different way of conveying ideas. It may take some practice for couples to achieve a communication that is understandable to both of them. A good way to start is to follow some simple steps in order for the communication to flow easily, even if the partners have very different communication styles. Take away all types of distractions when communicating with your partner. This includes the phone, computers, and TV. Talk about your feelings and needs using “I”. Within the conversation, do not involve and throw responsibility on the other. Be responsible for your own experiences by stating everything using “I”. We believe that relationships are there to make us happy and take care of all of our needs. However, happiness is more about living in a symbiosis with the other and taking care of their needs. A lasting relationship is one in which each person gives to the other and prioritizes their wants and needs. If the other person is just as committed to you as you are to them, they will learn from you and begin to prioritize your needs. This is the general way in which a good lasting relationship operates. Long lasting relationships between people who genuinely love each have this model work for them. Physical touch is one of the languages of love. it is the ultimate biological way to show another human being that they are important to you and you accept them completely. When couples are just starting their lives together, there is a lot of physical affection with each other. This stage of the relationship is something that doesn’t have to go away and it is something that can strengthen the chemistry and intimacy between the couple. Being generous is something that we all know theoretically. But what is it like to actually go a little out of your way to make the life of another easier and more pleasant? This is where generosity comes in. Generosity can show in many ways in a long lasting relationship. It could be done by trying to make the other laugh, being generous with your time even when you are busy, and giving small gifts once in a while. Being present in the moment is a subtle quality with a big effect on the interaction within a lasting relationship. THink about being with someone who is only paying partial attention to what you are saying or doing. Being present and being there for the other person through listening to them, paying attention to them, and seeing them when they are home is what makes you attractive to your partner. This means prioritizing the relationship and putting other things off for a second so your partner can feel validated and respected. A lasting relationship is something that should go on for a long time. It is impossible for two people to never change in the long time that they are together. Couples who want to be together know that and even expect it as a part of their journey together. Couples in a long lasting relationship will understand that things will change as the two people are changing. instead of feeling threatened, a good partner will accept this change s an integral part of their relationship and evolve with it. Everyone makes mistakes. This is an inevitable part of life and it is especially hard to avoid hurting someone who is in a lasting relationship with you. Couples who are solid in their relations with each other do not let fights and small arguments drag into their relationships. People in couples are so important to one another that they can let themselves admit their mistakes by asking for forgiveness and owning their mistakes. The other person is compassionate enough to be able to forgive. Holding grudges and ‘punishing’ the other are habits that can be poisonous to long-term relationships. That is why people who genuinely care for their partner allow themselves the time to calm down and let go of their hurts with the optimism that everything will work out fine in the future. No person in the world is perfect. While there can be strong degrees of compatibility, there will always be something about the other person that is not enjoyed. The difference between ordinary couples and those in a successful long lasting relationship is that those in long-term relationships understand the power of their perception of the other. A factor that predicts longevity in a relationship is holding a positive image of one’s partner. This means that although the partner exhibits different types of behaviors when one keeps focussing on their good qualities and what is preferred in them, the couple tends to stay ‘in love’ even when they have been together for a very long time. Stress is something that can eat away at us and particularly something that is so important to us as our lasting relationship is. When we are stressed, our relationships are affected as well. Most people can unknowingly transfer their stresses from other parts of their lives onto their partnerships. Things that you can do to manage your stress levels are seemingly little, but they help. It could be meditating, sleeping enough hours every night, eating well, and exercising. These things will not only improve your health but your relationship as well. There are some couples that tend to interact with each other as if they are on a battlefield. This is a pattern behavior that does not contribute to a good relationship. When two people are in a couple, it is in their best interest to understand that they are together on the same ship. When one fails, so does the other. While conflicts can arise and they do between two different people, couples who want to make it in the long run understand that they must solve the problems together as a team. It is no longer about who is right and who is wrong but more about “how can we work together to solve this problem that we have”. This type of behavior builds trust and friendliness between the two people and lets them solve conflicts in a mature manner. A long lasting relationship is not something that is a given. Compatibility between partners is only the soil on which the lasting relationship grows. Although it matters, a couple that wants to make something beautiful grow between them will cultivate their relations and grow as individuals along the way. And as Anthony Robbins says, “Do what you did at the beginning of the relationship and there won’t be an end”. It is all too easy to slack off when time goes by, but a long-term relationship does not have to be given up on. Make every day as if it is the first one you met the other to keep the relationship refreshed and alive.